Charles Robinson, free state leader and activist, wrote to introduce James Abbott to Eli Thayer, organizer of the New England Emigrant Aid Company. Robinson described Abbott as trustworthy and "true as steel to the cause of Freedom in Kansas." He wrote that the rifles previously shipped to Lawrence had had a "very good effect," and suggested that Thayer procure more. 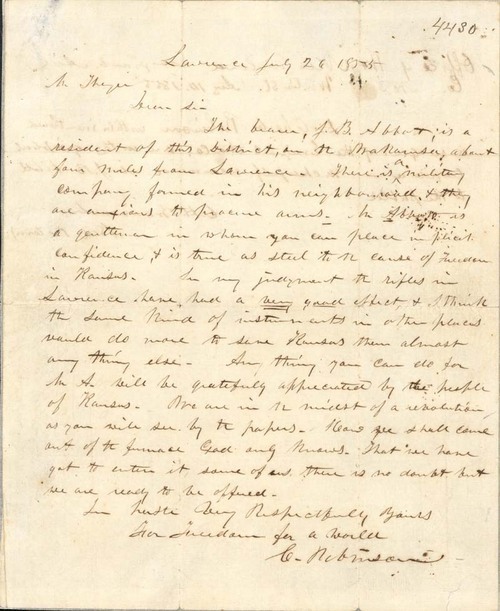 On the back of Robinson's letter, Charles Branscomb, Secretary pro tempore of the New England Emigrant Aid Company, wrote an endorsement of Robinson as an agent for the Company, and added his own support of James Abbott.